Priced: $73.83 - $149.00 Rated: - 5 stars out of 5 by 362 reviews. The North Face Apex Bionic Jacket for Men Features. The North Face Apex Bionic Jacket for Men. The North Face Apex Bionic Jacket for Men is made with the innovative TNF Apex ClimateBlock fabric that is wind permeability rated at 0 CFM, has a cozy fleece backer, and adjustable cuffs and hem for even greater protection. The hem cinch-cord allows you to adjust for a precise fit, and dual zip hand pockets and left Napoleon chest pocket provide ample space to stash essentials. The North Face Apex Bionic Jacket for Men is ideal for hiking outdoors in a challenging inclement weather. Something of a Phenomenon!! This jacket takes the work of a thicker jacket and makes it look and felt fashionably easy. The Android Hoodie Jacket is a very nice present for a boy friend or relative for his birthday. Fleece backer creates loft for added warmth. With its waterproof breathable laminate, TNF Apex ClimateBlock fabric is the most protective of The North Face soft shell fabrics. Constructed of 90 denier plain weave 100% polyester TNF Apex ClimateBlock soft shell fabric. Hem cinch cord to give the perfect fit and helps seal out the elements. Velcro® adjustable cuffs with molded cuff tabs. The North Face Apex Bionic Jacket - Men's: For cold weather activities, the Apex Bionic North Face ski jacket keeps you warm beneath its windproof exterior and comfortable fleece backer. North Face clothing constructed it with a hem-cinch-cord allowing you to adjust for a precise fit, as well as a left chest pocket which provides ample space to stash essentials. Whether worn as an exterior shell, or a standalone jacket, this North Face jacket is ideal for mild aerobic activities in challenging weather. Velcro adjustable cuffs with molded cuff tabs. If it's cold, and it's time to drop the clutch, this is the jacket. Water-resistant, breathable, stretchy and ready to rock. For windy, cold weather activities, The North Face Men's Apex Bionic Jacket is a coveted soft shell to keep you warm and windchill-free beneath its windproof exterior and comfortable fleece backer. A hem cinch-cord allows you to adjust for a precise fit, and dual zip hand pockets and left Napoleon chest pocket provide ample space to stash essentials. Whether worn as an exterior shell, or a standalone jacket, this jacket's ideal for mild aerobic activities in challenging, inclement weather. The Apex Bionic Jacket by The North Face is a versatile and widely popular softshell jacket constructed with ClimateBlock, a waterproof, windproof fabric that is also incredibly breathable. The Apex Bionic allows you the freedom of movement with its athletic cut and stretch material, and with a wind resistance level of 0 CFM, it will protect you from some of the more severe winter conditions. Perfect for wearing in challenging, inclement weather conditions where you are performing highly aerobic activities, such as: skiing, trekking, snowshoeing or climbing. The North Face Apex Bionic Jacket - Men's: The ultimate jacket you need in your wardrobe this season. The Bionic is meant to work with your body’s natural movement while being breathable and water-resistant. This is the perfect soft shell to keep you ready for windy and low temperature activities. The windproof exterior is equipped with a cozy fleece to keep you out as long as you need to be. This jacket offers a tailored standard fit with left Napoleon chest pocket to store your most essential items. Hem cinch cord adjustment in pockets. Zip into The North Face Apex Bionic Jacket and get better, stronger, and faster. Thanks to the fleece-backed windproof shell fabric, this jacket keeps you dry and warm on your earthly adventures. The four-way stretch moves with your body so you can hike up the mountain comfortably, and the DWR coating sheds light rain or snow to help you stay dry. When you're really working hard to get some miles under your feet, the Apex Bionic’s breathable weave helps dump excess body heat. A superior multi-season soft shell, The North Face Men's Apex Bionic Soft Shell Jacket keeps you warm and windchill-free beneath its windproof exterior and comfortable fleece backer. A hem cinch-cord allows you to adjust for a precise fit, and dual-zip hand pockets and left Napoleon chest pocket provide ample space to stash essentials. Whether worn as an exterior shell, or a stand-alone, this versatile jacket has built-in stretch for comfort during aerobic activity. The North Face Apex Bionic Jacket is one of The North Face's most popular softshell jackets because it delivers what you need for outdoor adventure: gear that moves with you and keeps you comfortable, even when the wind starts howling. Versatile in design, the North Face Apex Bionic Jacket fends off the cold while maintaining maneuverability, a much-desired skill for a cold-weather enthusiast. The soft shell fits to the body without sacrificing protection from the elements, as the windproof exterior and fleece lining keeps the user toasty inside. On the interior, numerous secure pockets keep valuable items safe from freezing temperatures or snow, making this an ideal jacket for outdoor activities, such as skiing or snowmobiling. Use as a liner or on its own, the choice is yours with this dynamic item. A great all-around soft shell for windy weather, The North Face Apex Bionic Jacket for men features windproof, water-resistant and breathable protection against the elements. If it’s cold, rainy, and windy out, then reach for you North Face Apex Bionic Jacket. With a high tech polyester fleece rated at 0 CFM, this jacket offers great windproof protection. This fabric also sheds light rain and dew with ease and provides the wearer with much appreciated core warmth. This jacket excels in aerobic activities in cool, damp conditions and as a single layer in Tucson winters. From the mountains to the town, this is one slick jacket. Constructed with Apex ClimateBlock fabric, the Apex Bionic is perfect for aerobic activities in cool, damp conditions or for use in more severe cold-weather conditions. Whether climbing to the top of your local mountain or just your local shopping mall this jacket is one of the most user friendly jackets out there. And if you have a home town like ours, you can even wear it to the symphony. Ideal for rock climbers when the weather turns cold, The North Face Apex Bionic soft shell jacket is water-resistant, breathable, and stretchy. The North Face Apex Bionic soft-shell jacket sports windproof features, and its stretchy, comfortable fit is ideal for multiple activities. It’s called Bionic because it works together with your body’s natural movement to enhance comfort and performance. The fabric is a special blend of polyester, nylon and elastane ripstop stretch that has a durable water-repellent finish. It’s also wind-resistant and equipped with a soft fleece backing that has natural moisture-wicking properties. Full-zip front with two pockets, hem cinch cord and Velcro®-adjustable cuffs. Imported. Colors: Cosmic Blue, Red Clay, Nautical Blue, Arden Green, High Rise Grey, Rhubarb Red, North Face Black, Deepwater Blue, Conifer Green, Leopard Yellow, Utility Brown, Bolt Blue, Noah Green, China Blue, Coffee Brown, Nautical Blue/Asphalt Grey, Sullivan Green, TNF Black/Biking Red. For windy, cold weather activities, this coveted soft shell keeps you warm and windchill-free beneath its windproof exterior and comfortable fleece backer. Ideal worn as an outer layer in milder temperatures or as a mid layer in cold weather conditions. Fleece lining increases warmth and comfort. Stand collar delivers increased protection. Two zip hand pockets and one Napoleon zip pocket. 18 people have already set their own price. 90D 351 g/m² (10.3 oz/yd²) plain weave polyester TNF™ Apex ClimateBlock. This jacket is an extremely versatile softshell. That being said it is not a rain jacket nor does it have the warmth of a down/ski jacket by itself. If layered properly underneath with a fleece or down sweater this jacket can be worn down to single digits. That being said this is my go to jacket in 40 degree and below weather, its completely windproof, repels snow, ice and sleet very well (rain will soak into it after a period of time). Does everything a great softshell should. I wear this jacket through most of the Minnesota winter (again properly layered underneath, depending on the temperatures) and have also taken it on a month long geology field course in the southwestern US, it was perfect for blocking the night time winds and keeping me warm while constantly outside. I purchased mine about 3 years ago when the TNF Apex was still embroidered on the sleeve and it has held up very well. It still sheds moisture and blocks the wind like it did when it was new. I have also seen the newer versions of this jacket and have heard complaints that the overall quality of North Face products has declined. I can't speak for all of their products but as this jacket is one of those that has become popular among people all over, not just with those who use it as it was designed for, it is now being sold in more places too. That being said I would not be surprised if the quality of this jacket has decreased in the last 2-3 years since I purchased mine. Overall I think this was and most likely still is a outstanding and extremely versatile softshell. It is now just more likely that one may have a defect in it since the North Face has gone to mass marketing these among many of their products. I got this jacket several years ago for snowshoeing. I use it as my outer layer, and I also use it in the Spring/Fall while hiking in the Rocky Mountains. It's very comfortable, and has a good number of pockets which are a good size for holding stuff you may want ready access to on the trail. In terms of blocking the wind it works great, been in 30mph gusts in the winter and stay toasty. I've also been in light rain showers and it does a good job shedding. Anything heavier/steadier rainfall it will stop shedding but the inner layer won't get wet. Had to hike a couple miles back in the rain and I stayed dry/warm. No rain seeped through the jacket. The draw strings work well at keeping body heat in. My only 'con' is the arms seem a little too long for me. The velcro straps work okay, and length of sleeves isn't a huge deal. During the winter while wearing gauntlet style gloves the length of the sleeves seems to be less of an issue then without them. Overall I love this jacket. It's effective, not bulky and can be used not just in the winter but also in the spring/fall which makes it very useful. Durability wise I have had this jacket for 3 or 4 years I think, and it still holds up. No major issues with the quality of the garment. The only time I had trouble with it was the zipper wouldn't zip up good, but I simply put a light coat of liquid hand soap on the zipper and it's worked fine for the past year or so. Not uncommon for a zipper to do that over time, and I wouldn't consider something so easy to remedy a fault of the jacket or The North Face. Now My Only Outdoor Jacket!! I purchased this jacket after returning a Marmot Precip Plus jacket that lost its waterproofness and didn't breath. I have no regrets! I really love this jacket!! The North Face has produced an awesome lightweight high performance jacket in the Apex Bionic. It is now the only jacket I use (OK, I DO have a hooded shell I bought in CO that comes in handy on occasion) for all 4 seasons. It will sustain my body temp comfortably with standard base layers down to around 40 to 45 without much movement, and down to around 37-38 with activity like moderately-paced walking. When it's colder than that, I use a thin fleece as an underlayer, and I'm comfy down into the 20s with no problems. It is the one piece of gear that has made the transition from fall to winter (I've historically hated walking in the cold) so much more bearable. This year, I was actually bummed that spring came to Virginia as early as it did. I now recommend this jacket as essential gear for outdoor fitness due to its performance, windproof/water resistant characteristics and lightweightness. I did buy an XL - I am 5' 11" and weight 205 lbs, and it is just a bit big on me, but I did so knowing that I wanted the extra room from a fleece underneath. If you want a sleeker fit, I recommend buying a size smaller. I've just washed it the first time (after 6 months of use) with minimal detergent and by itself and did have to retreat. I used a polymer spray (not silicone) - used both SofSole and Tectron spray. I understand that there is a product that you can add to the wash that aids in retreating the waterproofness made by Nikwax called Tech Wash. THUMBS UP NORTHFACE! This jacket is my first of this type. I normaly just stick with a combo of fleece, sweaters, and rainjackets to match the weather outside. However when you live in SC with sometimes a 15-25 degree temp swing, it can be hard to layer up when carrying around a ton of college materials in my backpack (hard to store those layers when its hot). Its a nice jacket and i will say it does boil down to a very nice windbreaker. However with just a tee it is good to about 50 before I need another layer. Its stylish enough that i can where it to casual interviews and not feel that its out of place with a shirt and tie but casual enough for daily use. I will say if your looking for something to run in or exercise in there are better options however for college or something like that and walking from class to class I find it very useful (the water repellent feature is very nice for light ran or running from class to class in downpor). Another thing i found is that the collar doesnt want to stay down on the right side which is a bit annoying. Lastly I will say that being 6'4" I find myself wishing that they had a tall size so i could wear a medium and still have long enough sleeves. To sum it up if your wanting a jacket for the backcountry there are much better options however if your wanting a great, dressy looking jacket to wear around town and still be versitile to be out in the frontcountry this is the one to buy. While browsing for a new jacket for my son for Christmas I spotted this one made by Northface. I remembered that his sister has one that seemed to be basically the same jacket ( in women's style of course) and I realized that she has been wearing the jacket for a couple of years now (not a small thing considering she's owned many coats and jackets the last couple years that I've seen on her a few times and then never again). So I realized this jacket seems to be her goto jacket - meaning it would surely please her brother to have one. Well, that is exactly how it turned out at Christmas when he opened the box. It was indeed pretty much the same as his sister's (but in men's style) - and she couldn't rave enough to him about the "amazing" wind protection it gives and how she has even used it for snowboarding with a sweater under it because the fabric is so flexible and giving - as well as the cut of it. My son loved the jacket - said he'd never felt anything like that fabric and he said it felt great to wear. I gave it a good rating in durability since I know my daughter's has held up very well for a couple of years now. Finally, he is about 5'8" and lanky and the medium fit him perfectly -- no "ape arms" (too long) like on some jackets! Bought this as a gift for my boyfriend. Was on the fence since some other reviewers were complaining about a tight fit, and he has a powerful/top-heavy build, 5'10" and 230 lbs, most of his size being in his chest and shoulders. I decided to try his usual size L. He loves this fleece and says it couldn't fit better if it had been tailored and I agree! The overall quality is outstanding, just what I would expect from TNF. He is a dedicated outdoorsman who is acclimated to Western mountain weather and feels that the weight of the jacket is just right down to deep freezing or high wind conditions. The asphalt gray/ether gray color combination is also very attractive and masculine. Looks and performs great in both the city and the country. Overall we're both very happy. The only possible negative about this jacket is that some guys may want to order up a size since it's cut to taper at the waist and not be boxy, which may be unflattering or uncomfortable for some. If you are larger through the middle of your body then the cut might not work at all for you. Do note also that this is a fleece jacket, not a coat, and does not have a waterproof/windproof shell. Always wanted a great Softshell. Tried many knock offs spent a few hundred on Eddie Bauer, Performance, Port Authority, etc. All of them let in the wind and if it is anything more then a sprinkler spraying onto the sidewalk you are going to get wet. This Apex Jacket holds up to a lot of abuse. Not sold on the Pockets not being fleece lined on both sides (mesh on inside, yes you can see your hand) They also go all the way up to the chest seam?? If you went out to get the newspaper you could put it in your pocket, if it would fit through hand opening. Not sure why it is this way but oh well. It does keep you warm and blocks out wind AND Weather even a short passing shower beads up and brushes off. The High "Big Collar" yes I can put my chin in and not have to stretch it, is so warm and tells the wind to take a hike. I am hoping to have this for many years. Looks great and the fit is perfect. I can layer underneath and even put a Shell over when it becomes really wet. I am 6'2 260 yes big boy and I could have gotten away with a XL. I bought the Apex Bionic jacket in the red and gray. Not sure why it's the cheapest of all the color choices because I think it looks great. The jacket is a very nice light jacket to have for casual dress. The light fleece lining inside helps to keep you warm but not too warm. The two complaints I have are with the stiffness of the jacket and the overly tight fit in the armpit area. The tight fit in the armpit area makes your short sleeve shirts bunch up in that area when you put the jacket on, which is annoying. It also makes it difficult to wear anything beyond a thin, long sleeve shirt underneath. Wearing a sweater or anything bulkier underneath probably wouldn't be comfortable. The stiffness of the jacket seems to be a common complaint. While I appreciate that the stiff outer layer is what protects you from wind and light rain, it does make the collar ride up on your neck and makes movement a tiny bit cumbersome. Despite these two issues, I do like my jacket very much. Being in southern California, a good light jacket is very useful and I'm glad to own one like this. I bought this Jacket because I needed something a little warmer than the Apex Pneumatic Jacket I owned and use for train running early Spring/Summer/Fall. The Apex Bionic did the trick this is a great jacket if you are active outside on cold days (hiking, fall football games, walking around town etc.) You can feel the difference in the weight and thickness of this soft-shell compared to others. However, This is not the jacket you want if you are sitting out in the cold (below 40) for long periods of time. It is build for action. It is also not a great layering piece so don't think you are going to warm it up with a sweater underneath. It fits true to size but there is NOT a lot of extra room for bulk underneath. I live in UpstateNY and I use this over my t-shirt or under armor for walks with the dog from 25-50 degrees and it is comfortable. It is also fine for walking into a store without sweating to death. I am happy with it's performance in the wind, the apex pneumatic definitely breaths better albeit for warmer temps but I still can't complain. This is a very comfortable and well made jacket. This jacket is my favorite jacket that I own. I just replaced my old Apex with a new one because my old jacket wore out, after 6 years of pretty much daily wear except during summer months (which is not much in my part of the country). I use this jacket for almost every activity under 65 degrees (F). I used this primarily in eastern Idaho and north Utah where temperatures dip far beyond chilly. Some complain that this jacket is not warm enough. Let me set the record straight. This jacket is NOT, nor will it ever be as warm as a down jacket. It is a thin jacket with a very thin fleece lining. It was not intended to be exceedingly warm. However, I layer under it in 0 degree and below weather and I do just fine. I usually wear this jacket to school, but have also worn it camping, hiking, rock climbing, cross country skiing, and even during outdoor winter football. Yes, I love this jacket. I love it so much that I replaced my old one and bought my wife one as well. Some of the best money on outdoor gear I have ever spent. This was intended to replace an older REI softshell of similar design; however, this jacket fits like a sail. I am 6'1", not a heavy guy but far from rail thin, and received a large as a gift. I would not want the sleeves to be any shorter, and would prefer a little longer torso. So a medium would not have fit. The main problem is that there was just a tremendous amount of extra space in the torso and even in the arms, and was rather stiff. If your expectation is to treat this more like a general purpose jacket, I suppose that would be fine. My intent for this jacket was for cool weather outdoor activity: something fitted that moves with me, something I can wear under my heavier ski jacket without feeling bulky. My first thought was that they had sent a "big and tall" sans the tall. On the "plus" side, there is definitely room for layering! I'll be keeping my old REI shell for now, it is a size large and fits perfectly. As far as quality, I would say it is in line with my expectations for North Face with the exception of the zippers. Someone else mentioned the zippers. They seem pretty cheesy to me, with very fine teeth. Since when do these hold up? Disappointing, North Face. This jacket claims to do everything it doesn't and more. It's breathability and moisture wicking properties are almost nonexistent, nor is suitable for any level of aerobic activity or cold weather. Many a times in the fall season I'd find myself taking it off b/c it would get clammy just from me walking around. (And no I'm not a perfuse sweater; 5'4" male 125 lbs athletic build) So forget about even exercising in it! Plus during the colder months there's the added bonus of catching a cold, since I would take off the jacket only to put it back again two minutes later b/c it's cold. Which, by that time means my back is moist AND cold. If you're getting this jacket b/c you absolutely LOVE the way it looks (not like, not love, but LOVE w/ CAPITAL LETTERS) then by all means get it. For everybody else, I implore you look elsewhere. It's too hot for those autumn days and too cold for the winter months. As for the features mentioned in the 'Description' lets put it this way; the two best technologies on this jacket are a) the DWR finish and b) the zippers, everything else fails to deliver. I really did. But as great as it looks (and it does look great! ), I seem to skip over it when choosing a jacket to wear. Here's why: there's no "right" temperature for this jacket, no sweet spot. I was hoping it would be great for slightly chilly spring and fall days. But it provides very little warmth, so that didn't work. Next I thought I could use it in place of a sweater or sweatshirt; that failed because although I'd be comfortable when I first put it on, the lack of breathability left me sweaty even on a short walk. So it begs the question; when will you wear this? Answer: not often. I like wearing the jacket. It is light and has a nice fit. Trouble is it has zero R-value. This is not a jacket I would wear for active sports such as biking, running or cross country skiing. There are much better jackets for that job (true windbreakers with high breathability). I use this for casual running around town, walks, etc. Even with a layer of fleece this jacket is chilly in the 40's and below. When the temp is in the 50's and up this jacket is overkill. From a practical standpoint, this jacket is good for having in the car. Expensive and pretty worthless. Consider this to be an expensive wind breaker. This was a great shell at first sight, good quality materials, good feel (as expected from TNF), and the color selection is great. When you put it on however, and later try to move around with it, it's the worst fitted piece of clothing I ever put on. The torso cut is a brick shape, so M size would stretch on my chest, and the L would hang like a parachute. I'm not a body builder triangle type, just fairly fit like most other REI patrons. I got a killer deal on this jacket during one of REI's clearance sales, and I'm still considering returning it. It just doesn't do much well. It will soak through in about 20 minutes of rain. It is OK for wind, but the breast pocket has no backing or flap so air just rushes through the zipper. It doesn't breath well. It's just mediocre at everything. You can do better if you're paying anything close to full price. I use this jacket for normal everyday use. Im not impressed with the warmth nor windproofness of it, it is not suitable for weather below 40 degrees. It would work nicely as a liner for another jacket. I do like the look of and it has a slimming effect. It is very comfortable and easy to move around in it. People do like this jacket and that's fine. However, I've used this thing in different environments and it's not impressive. The fit and feel is too stiff for my taste. But, This jacket is great for just mall waking. I have purchased 2 of these and the zipper broke on both of them in less than a year. For the price it should be durable but it is not. Both the main zipper and the chest pocket zipper broke within ~12 months after normal use. My first and last TNF jacket. This jacket does what it says very well. It blocks out almost all wind, and it is also quite waterproof. You will be dry unless water trickles down the neck or the sleeves. For the most part, this jacket works quite well for what it is said to do. However, there are still a few shortcomings to this jacket. First, is the fact that this jacket isn't very comfortable. It's a little stiff, and the material on the inside isn't exactly the softest thing in the world. Second, is the fact that this jacket isn't all that warm when you're standing. It's actually still relatively chilly in comparison with the other jackets. That being said though, if you take this jacket and you're doing an activity, such as say, biking, you will be warm. The jacket is windproof, which also means it traps heat very well. In other words, so long as your body is generating heat, you will be warm. Otherwise, you will be cold. If you combine this jacket with a pull over or a fleece, then this jacket is actually quite warm, and will get you through 40 degree days any day. I suspect that it will also get you through 20-30 degree days as well, as wind chill is practically unheard of with this jacket. It's a great jacket. The build quality is good. It does what it is advertised to do well. Note that I believe the reason this jacket is cheaper than its competitors, is because this jacket is missing a lining. Lacking in warmth and no inside pockets are my cues to return this jacket. I have an REI "One" jacket that is five years old and consistently one of my most frequently used jackets. It offers warmth, flexibility and features for a much better value than any of the name brand jackets you could compare it to. If it were not for my considerable weight loss this past year, I would still rock the REI jacket. Now, I am forced to make another choice and the North Face Bionic is only so-so in the soft shell category. I have worn it for almost a month of Southeast fall temps and it is not warm at all. This does not bode well for its use in our winters. Will most likely go with the REI Elk Ridge, even though the arms felt a little short in the store. Same great TNF Apex Jacket as always however, the TNF/Biking Red is Maroon and not the "Biking Red" pictured on the website. 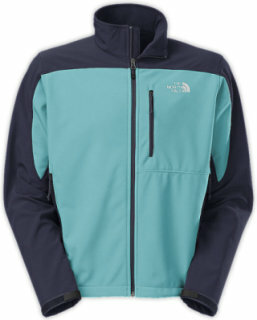 North Face should have recalled these jackets or directed their resellers to list the actual color. I am working in Afghanistan and needed the jacket for current temps. Attempting a return while waiting for the color I orderd was an uncomfortable option I chose not to exercise. Kind of like asking for a car and getting a bicycle, not exactly what you wanted but still transportation. Back Country could have done / should have done better. 3 stars for TNF Apex form, fit and function. 0 stars for getting what I ordered. I bought two, one M and one L, and plan to return them both because neither fit well. I'm 5'11", 175 lbs. I'm quite an ordinary sized human. The L was gigantic in the body, and the arms were way too long. Shoulders were far too broad for me. Clearly too big. The M was a great fit in the body, arms, and shoulders...but the body of the jacket length is too short. Clearly the "right" size, but as soon as I lift my arms my belly button shows. Uh, that's not going to keep me warm anytime. My first soft-shell. Good for around town or walking the dog on cool breezy days. I would not use this in the backcountry. Zero breathability - So if you're putting out some heat, you're going to quickly over heat and soak your base layers. This thing gets quite clammy when on the move. Not the warmest jacket, but good enough to keep you warm on your travels from the car to building. As long as you're not buying this for backcountry use, you should be pleased. Fit is true to sizing chart, so make sure you reference that. I was very excited to find a jacket for my husband, he wears 3xl or 4xl, but sad to say the 3xl did not fit. Would love to see larger sizes available 4xl or 5xl would be great. He loved the jacket because of the color, larger sizes for big guys only seem to come in black. So if you would pass this on to your buying group to help support the big guy in 4xl and in great color options i will be ordering again. I'm 5'11", 175lbs and bought this in a large. Sleaves are plenty long, lots of room in the chest but the armpits are positioned way too high. Because of this using the jacket as a shell over a fleece/heavy sweater/anything bulky is impossible. That being said, its reasonably warm by itself and provides good wind protection and decent wetness protection. Would recommend with the sizing the caveat I mentioned above. Good material and stitching. Really this thing is too short to be a serious outdoor jacket. Give us 3 more inches in body length at least, or it just rides up and you have wind on your belly and spine all day. Very annoying and disappointing. Forget bicycling, climbing, X-country skiing or anything else where you have to actually move. Not so comfy, but it works. It keeps out the wind and cold. It is rugged and stiff.Great for just outdoors. This in not an everyday look at my Northface jacket!